Some 60 delegates attended a Dolfin briefing on 2 May to discuss the opportunities open to investors in technology, and the ways in which tech entrepreneurs can grow their businesses through investment. These questions are nothing if not challenging, but Dolfin brought together a panel of specialists equal to the task of addressing – if not answering – them. 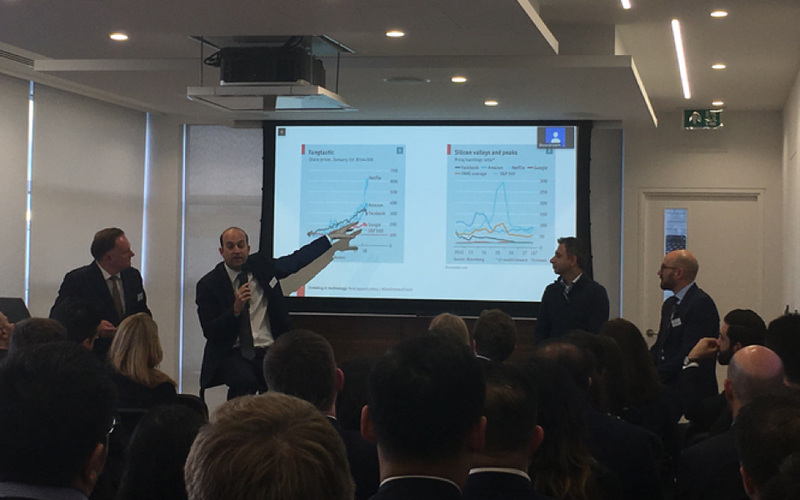 Tony Jamous, President & Co-founder of Nexmo, brought a venture capitalist’s perspective to the discussion; Fidel Manolopoulos, Growth Capital Investor, Hermes GPE, addressed issues from the private equity point of view; and Dolfin CIO Vassilis Papaioannou took a public market angle. Chairing the discussion, Andrew Carrier, Dolfin’s CMO, began by describing the typical trajectory a tech company follows. In the start-up phase, he said, entrepreneurs typically look for venture capital, further growth is often funded by private equity, and finally successful companies go public. But this is not always the cse. A question that both investors and entrepreneurs must ask themselves is what makes an enterprise most likely to attract investment. Carrier quoted Warren Buffet’s words: “We’re perfectly willing to trade away a big payoff for a certain payoff.” But what do the panellists look for? For Manolopoulos, the team behind the business is key. “I look for a founding team that can be complemented by seasoned managers but will still have the power to drive the business forward,” he said. The panel went on to look towards the future. The possibility of a backlash against the giants of Silicon Valley was discussed, with the panel agreeing that more regulation in the tech space is broadly to be welcomed. “But regulation lags innovation,” Papaioannou observed. Taking a global view, Papaioannou remarked that AI is at the heart of the conflict between the US and China, which has access to funding but has yet to catch up. In closing, the panellists were asked to share their best advice for investors, and all were in agreement: successful investors look for technology they understand, which is related to their industry. They don’t follow trends, but ensure they have the edge by looking for potential others aren’t likely to understand. We will be exploring some of the issues raised at the event in more depth in future Dolfin Diary articles. Subscribe to our updates for notifications of these and of future Dolfin briefings.